International Babywearing Week (IBW) is October 2-8, 2017. The mission of Babywearing International is to promote babywearing as a universally accepted practice, with benefits for both child and caregiver, through education and support. Threaded Together refers to the fact that many baby carriers are made from woven fabric. Some are machine woven and some are handwoven. 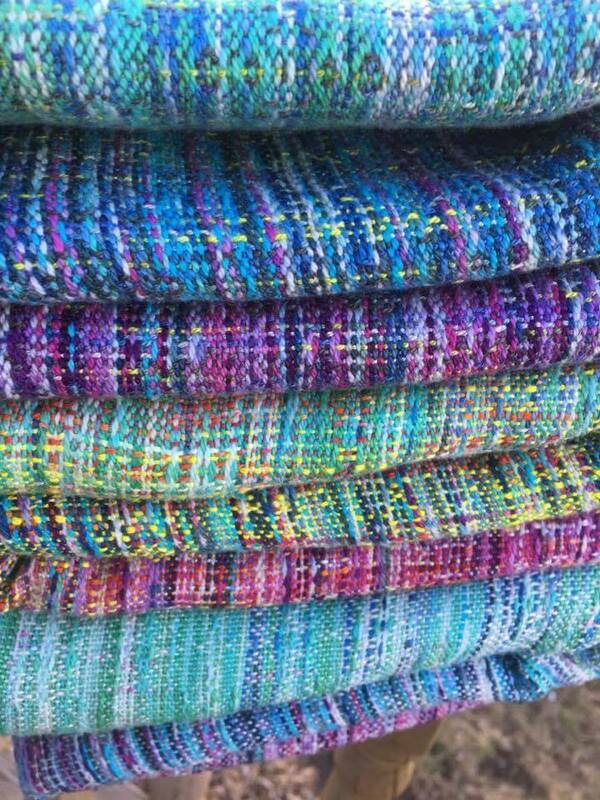 Handwoven fabrics take a lot of time and energy to make and that is part of what makes them so special. I have been handweaving for about 2 years and through this post, I’d like to share with you how the process works. First, the fiber! There are so many fiber options when it comes to weaving! I’m personally a big fan of cotton. It’s easy to care for, it’s very soft for wearers and babies alike, and it is readily available at a reasonable price. Other options available are hemp, tencel, bamboo, silk, and wool (just to name a few). Next, the math. Weaving requires you to do a bit of math to determine how much fiber you will need. This is dependent on the thickness of your fiber, the weave you intend to do, and the dimensions of your project. 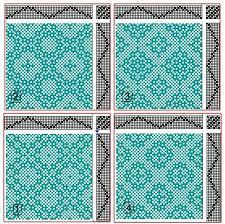 Luckily, there are several free online weaving calculators available. 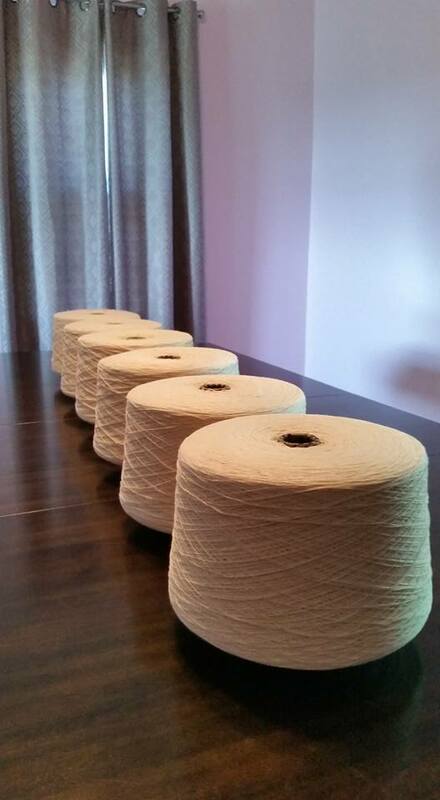 With the cotton I normally use, I use 24 strands per inch and a total of 30 inches wide. So that’s 720 individual strands of fiber that I first have to measure. The tool I use for that is called a warping board. So my fingers run over every inch of fiber as I measure it. After I measure my fiber, I chain it up so it is easier to handle and doesn’t get tangled. This is just for the warp, or the fiber that runs the length of the cloth. 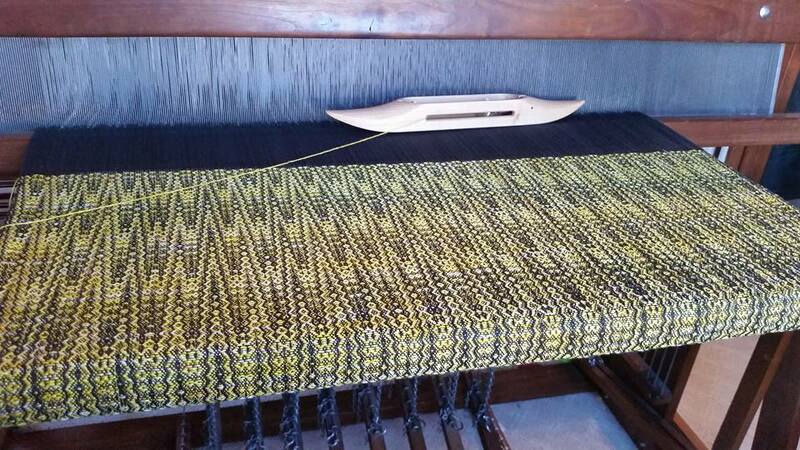 The weft is the fiber that runs the width of the cloth and can be measured using a yarn swift. 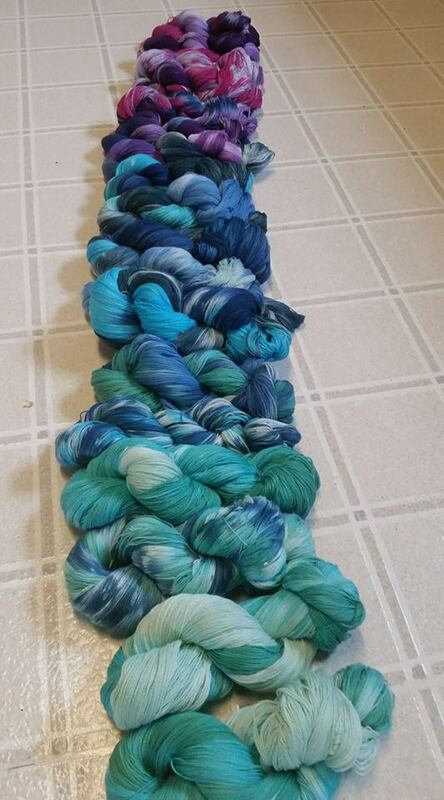 After it’s measured, I dye my fiber! This is one of my favorite parts of the creative process. I purchase natural fibers that are ready to be dyed. Some weavers purchase pre-dyed fibers and create their visions with those. The fiber must be prepared using chemicals – safety is very important here. 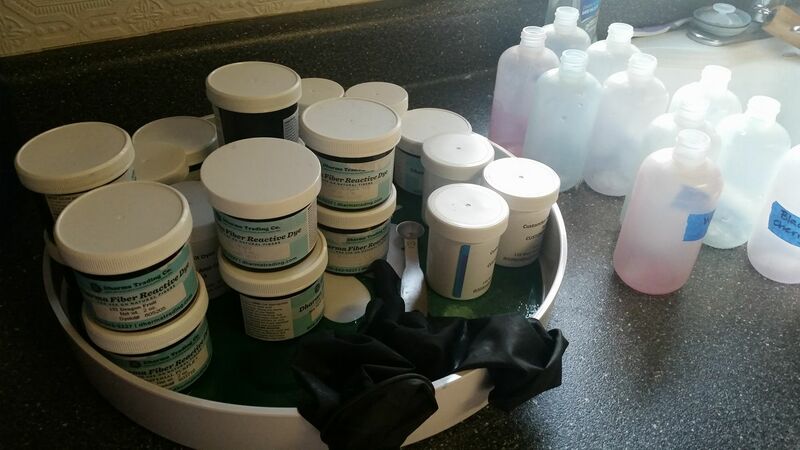 Then the dye is mixed and applied to the fiber. There are many different techniques that all produce different and amazing results! Once the fiber is processed, rinsed, and dried, it is ready to go on the loom! 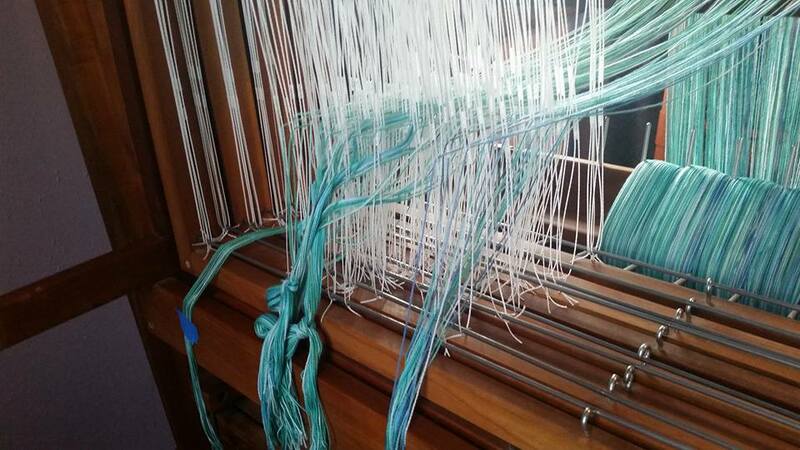 Warping the loom is the process of getting the chains of fiber onto the beam of the loom. There are different types of looms and different ways to do this. 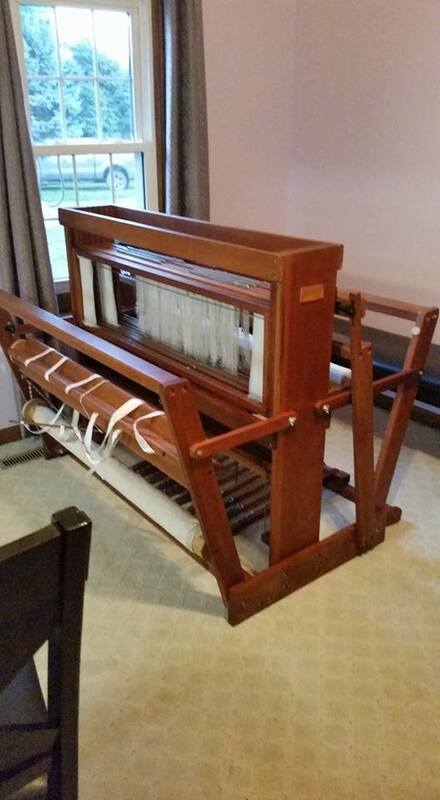 For this post, I am going to describe how I warp back to front on my floor loom. Using a tension box, I feed the fiber through a set of dowels and a comb that keep tension on the fiber while making sure there are no knots or tangles. I repeat this step until all of my chains are wound onto the back beam. The next step is called threading. This is one of my least favorite steps because it is very labor intensive and if you make a mistake, it can mean re-doing A LOT of work! Each individual thread must be pulled from the backside of the loom through a heddle to the front side of the loom . The heddles are on the shafts, which raise and lower to separating the different threads to achieve the draft. You must follow your draft exactly so that when you are weaving, you get the desired results. See example drafts to the left. Once threading is complete, it’s time to sley the reed. The reed resembles a comb. The threads are pulled from back to front through the reed in the appropriate number to result in an even weave. The reed is part of the beater, which is a moving part of the loom. The beater gets pulled forward to force the weft yarn into place against the warp. Next it’s time to tie all of the yarn onto the front cloth beam. This step is very important because you have to ensure that all of the yarn has the same tension. Uneven tension is a weaver’s worst nightmare. I tie a knot for each section, then go over the threads with my fingers checking the tension and tightening as needed. Once I’m satisfied that it is even, I go through and tie a second knot on each section, securing everything in place. Finally, I have to set the tie-ups on my treadles. Treadles are the peddles you push with your feet to get the shafts of the loom to lower and raise. The draft you have chosen to weave will determine how to tie up your treadles. Now it’s time to weave! I wind my weft yarn (which I have most likely hand-dyed) on a bobbin and place it in the shuttle. Then following the draft selected, I press the appropriate treadle and throw the shuttle between the separated yarn. That’s one pick. I continue to follow the draft pattern and throw the shuttle thousands of times per wrap. When I’m all done weaving the warp, it’s time to finish the project. The fibers must be set by washing, drying and ironing. Care must be taken not to destroy the fiber in this process. Cotton is easy and can be thrown in the washing machine. But fibers like silk and wool must be hand washed and air dried. Then I measure twice and cut once to get the wrap to the desired size. I hem the ends and sew on my tags. The entire process takes anywhere from days to weeks to months depending on the complexity of the weave, the length of the warp, and my ability to juggle parenting and late nights. This does not include the time I spend talking with my customers to make sure the final product matches their expectations, as much of what I do is custom work. Babywearing is the reason I became a handweaver. I love weaving wraps for caregivers to carry their little ones. So the theme of IBW 2017 really connects for me. I have threaded together thousands of fibers for different caregivers to wear. I will always have a connection to the people using my creations because I poured so much of myself into making them. I hope that every person who babywears can feel that love!